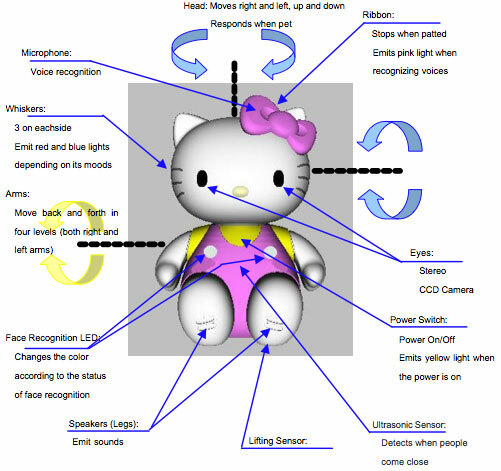 Business Design Laboratory, NEC System Technologies, and Futuba Industrial Company collaborated in development of Hello Kitty ROBO released November 1st, 2004 to celebrate the Sanrio character’s 30th birthday. It sits about 52 cm tall, has a moving head and arms, its eyes are video cameras that can recognize different human faces (up to ten different people), and it can talk to you. About 20,000 patterns of conversation were preprogrammed into the robot. Plus it builds on its history by visiting with you. Hello Kitty displays emotion by tilting or nodding its head, moving its arms and its whiskers can flicker in two different colors. 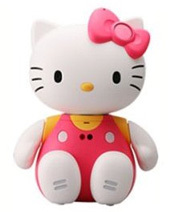 Hello Kitty Robot was initially sold for about 400,000 yen (about $3,300 U.S. dollars). Futaba Industrial was the manufacturer. 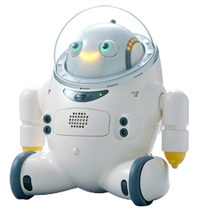 They previously built ifbot, a therapy robot that looked like an astronaut, designed by Business Design Laboratory which began shipping in April 2003. ifbot was sometimes called the Dream Supply Yori-soi ifbot and sold for about 604,800 yen. It could visit with you, act as a calculator, play memory games, provide advice and collect medical information. See Business Design Laboratory’s 12 July 2004 Press Release for additional information on the initial Hello KittyROBO. Hello Kitty ROBO is now being updated to Hello Kitty Robot and its price is being marked up to about $6,300 U.S. The new version will include stereo cameras, voice recognition, ultrasonic ranging and can tell when it has been picked up. It sounds like they are marketing it as a parenting aid (baby sit / entertain your kid when you are busy). hello kitty is the best and coolest ever.i love hello kitty i wish i could see her in person some day.